According to legend, in 718 in Katsunuma ( Yamanashi on the main island of Honshu), the holy Gyoki gave him vines handed over by the Buddha Nyorai and built the Daizenji Temple. In honor of the Buddha, Gyoki created a still standing statue in the temple called Budo Yakushi (Budo = Wine, Yakushi = Teacher of Medicine). For a long time, wine was considered to be a healing medicine in Japan. 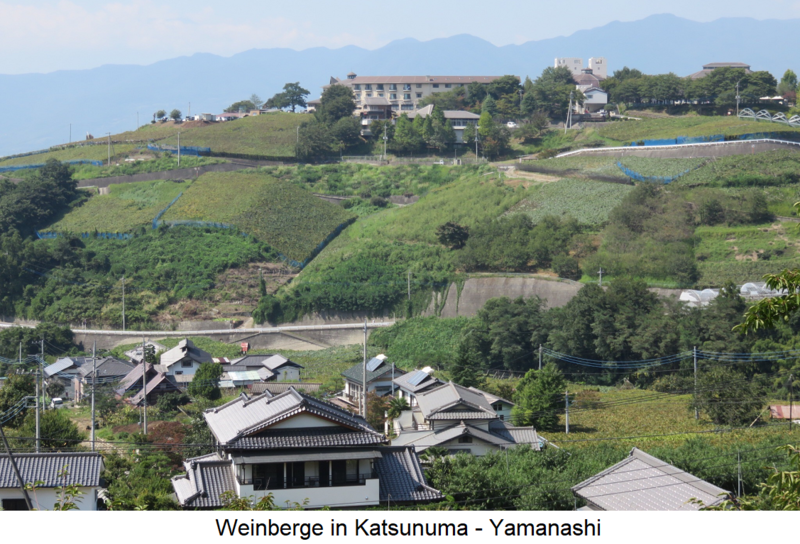 Yamanashi is still today the wine center of Japan with about 30 modern production plants. Buddhist monks spread vines all over the country, but the wines were mainly used as a carrier for medicines. The variety shown in the picture Koshu was allegedly discovered around 1186 at the foot of Fujiyama, it is still the most popular variety of Japan today. In the 16th century, Portuguese Jesuit missionaries brought red wine (tintashu) as a gift. In 1569, the Shogun Oda Nobunaga hosted a much-touted wine festival for its samurai generals. At the beginning of the 17th century, the still used today pergola similar form of education Tanazukuri introduced, in which the vines pulled man's high and the shoots like a roof up to 10 meters in all directions on support wires and protected in the winter with straw mats. This is intended by the prevailing high here humidity favored decay can be prevented. In the Meiji era (1868-1912), Japan began to open up to Western ideas and techniques. This also affected the viticulture and in 1877 the winery Dainihon Yamanashi was founded, which is a forerunner of today Mercian Katsunuma Winery, the largest producer with a fifth of the amount, applies. One year later, Masanari Takano and Ryuken Tsuchiya were replaced France sent there to know about viniculture and winemaking to get. After two years, they came back and used their knowledge. Although the company was closed soon after in 1886, this is considered the first beginning of Japanese viticulture. At this time was also trying to wine out autochthonous Varieties, mostly hybrids to win with Asian genes. One from the Asian vine Yama Budou Wined red wine was added during the Phylloxera disaster even exported to Europe. The authorities allowed for the first time to import foreign grape varieties into Japan. That was the beginning of modern Japanese viticulture. But only after the Second World War began a boom. From the year 1970 a wine boom began especially for red wines in connection with the world exhibition in Japan, to which among other things the French paradox contributed. Nagano, Okayama, Osaka, Yamagata and Yamanashi (coincidental with the historical province of Kōshū) with the best area of ​​Kofu Valley. Although they lie at the same latitude as the Mediterranean, the climate but it is very different. There are very cold winters, humid rainy springs and autumns, as well as summer typhoons. The origin of the wines is on label declared by "Kokunai san" (domestic wine) or "Yunyu san" (imported cask wine). But you can not necessarily rely on that, because most of the wines issued as Japanese (including top products) are blends of low Japanese content with wines from South America and Eastern Europe. Winemaking is dominated by a few large corporations, many of which purchase their grapes from many small vintners, often less than half a hectare in size. The five largest Japanese manufacturers account for around three quarters of total production. The most important wineries include Asahi (Ste Neige), Château Lumière, Grace Wine (Chūō Budōshu), Mann's Wines Katsunuma Winery, Mercian Katsunuma Winery, Sapporo (Polaire) and Suntory (with winery Tomi-no-Oka Winery). However, the Japanese national drink is still the one in spite of the existing wine boom sake (Rice wine). Cabernet Lion red - ? Cabernet Suntory red - ? Gewurztraminer / Traminer White - ? Ishihara Wase red - ? Koshu Sanjaku White Kosju Sanjaki, Koushuu Sanjaku ? Koshu Semillon White - ? Kyoho red Ju Feng, Kioho, Kyohou ? Neo Muscat White - ? Petit Manseng White - ? Riesling Forte White - ? Riesling Lion White - ? Schiava Grossa red - ? Villard Blanc White - ? Villard Noir red - ? Yama Sauvignon red - ? Yama Semillon White - ? This page was last modified at 19 September 2018 at 10:15.